The cat hair may seem unavoidable, as you see above, but we try to be environmentally responsible when we pack your order. 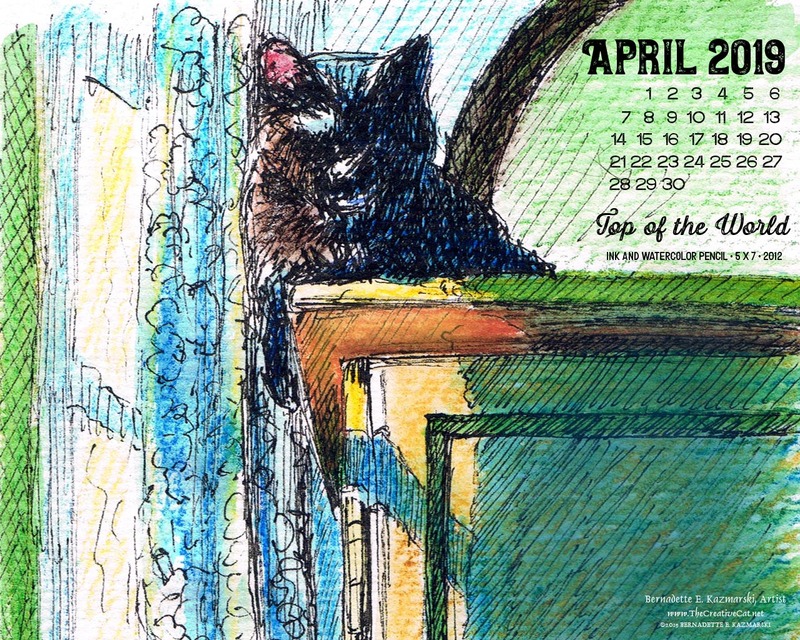 The sketch above, sans the lettering, was a daily sketch from September 27, 2012 when Giuseppe, Sunshine, Jelly Bean and Mimi were helping me with packing an order of cards. 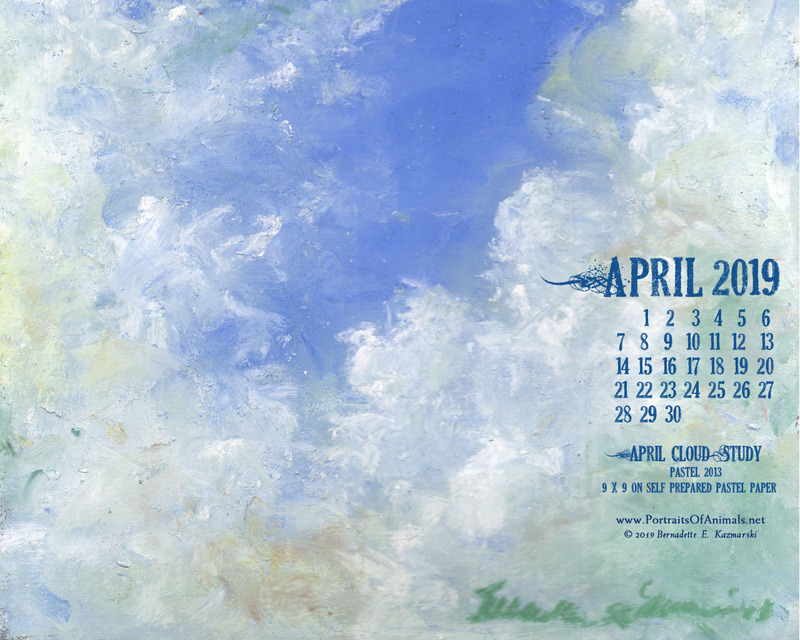 Within hours I decided I’d use it for something to do with my art business, even visualizing the hand-lettering in place. I already have a package insert that I use as notepaper in most orders, pictured below, but I also wanted to explain a few things about packaging and shipping from my studio. 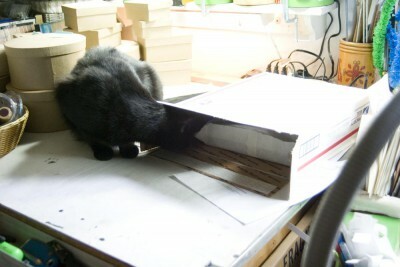 Mimi inspects the interior of a box prior to packing. I use recycled packaging, not the kind you purchase made of recycled materials, but the ones that I’ve recycled myself—envelopes, cardboard, padded envelopes and bubble wrap, paper, plastic, you name it, I keep it, and I use it whenever possible. Padded envelopes with the address removed are great for wrapping small originals with glass, or easily damaged items. The paper slipped into premade frames so that an image shows through the glass makes great packing when I roll it up in a ball and stuff it around small things in a box. Paperwork and even flat items can be slipped into a catalog envelope in which I’ve received a catalog or paperwork from someone else. And best of all, empty cardboard tubes from toilet paper and paper towels make great spacers in packages even if they look a little suspicious. In short, I reuse things that work for packing and shipping before I use new materials, but I’d never want someone to feel I thought so little of my handmade goods or of their purchase that I’d pull something out of the trash to pack it in. Because it may look to some people as if I’m just being cheap and using paper out of someone’s trash bin, I found the package insert a good way to explain what was up with this. 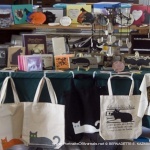 But there were other principles of my business that I wanted to share as well. 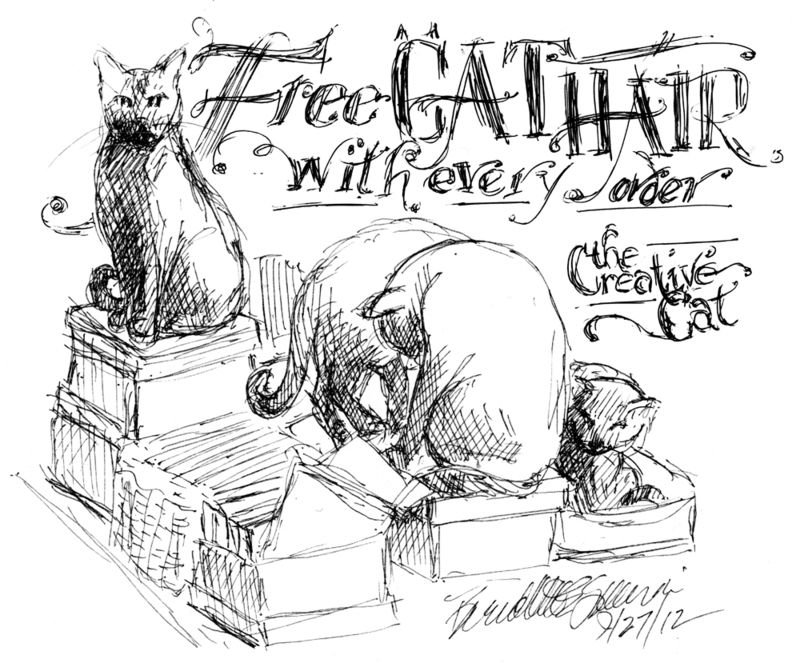 The “free cat hair” package insert. 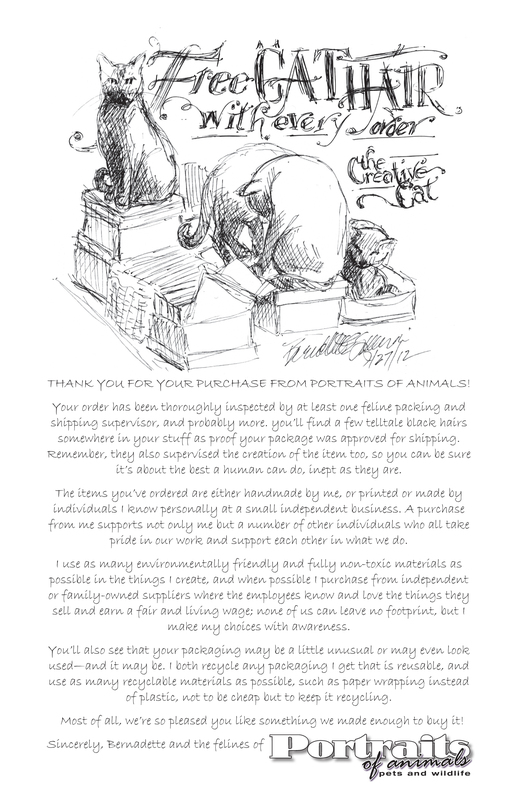 Thank you for your purchase from Portraits of Animals! 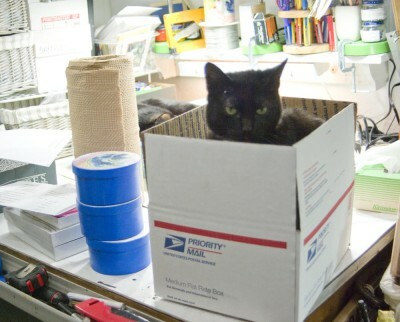 Your order has been thoroughly inspected by at least one feline packing and shipping supervisor, and probably more. You’ll find a few telltale black hairs somewhere in your stuff as proof your package was approved for shipping. Remember, they also supervised the creation of the item too, so you can be sure it’s about the best a human can do, inept as they are. The items you’ve ordered are either handmade by me, or printed or made by individuals I know personally at a small independent business. A purchase from me supports not only me but a number of other individuals who all take pride in our work and support each other in what we do. I use as many environmentally friendly and fully non-toxic materials as possible in the things I create, and when possible I purchase from independent or family-owned suppliers where the employees know and love the things they sell and earn a fair and living wage; none of us can leave no footprint, but I make my choices with awareness. You’ll also see that your packaging may be a little unusual or may even look used—and it may be. I both recycle any packaging I get that is reusable, and use as many recyclable materials as possible, such as paper wrapping instead of plastic, not to be cheap but to keep it recycling. Most of all, we’re so pleased you like something we made enough to buy it! Portraits of Animals logo in black. That pretty much explains it. I use as many recycled things as possible, and much of it you can recycle as well. Used packaging is usually only used on the outside layer—for instance, a small painting will be wrapped in paper or slipped into a paper bag, and then slipped into the used padded envelope. But just as I strive to make the best environmental decisions in the materials I use, the papers I choose for printing and even the printers who use environmentally-friendly inks and toners, I also try to make the finishing friendly as well. I am a small business and I rely on business from others, so I give business to others. I’ll drive a little farther or pay a little more to purchase my materials at a family-owned business where they remember my name and will special order things for me, and where I know their employees are paid a fair share of what the store makes. And usually I do purchase things in person rather than ordering over the internet because I want to keep these stores alive, especially when I’m buying just a few things. In the end, with shipping and other costs, I end up paying the same amount for most things if I buy them in a local store or if I buy them from one of the big sellers on the internet, and I can have it tonight, not wait up a week or more. Bulk purchases are a little different, but I still try to choose sellers on the internet who are fair employers and follow environmentally friendly business practices. For instance, the wood blocks and panels I purchase for my wood-mounted art and some of my own paintings are made in Canada from managed wood lots by a small family company and contain no toxic treatments, adhesives or finishes, they are just plain wood, and I can purchase them from the art store that has a branch here in Pittsburgh and which employs art students at one of our many universities or from the main shop on the internet if there’s a size or quantity I find I need. But they remember me at the store when I go there, and I can talk to a knowledgeable human on the phone when I call the main place. And when I do purchase packing materials I purchase recycled and recyclable materials as often as possible because I don’t want you to get stuck with something that will just take up space in your trash. The office supply warehouse that has its headquarters in my town of Carnegie has a full line of things like packing peanuts that will dissolve in water—and they do, I had to try it. And typically I ship with USPS using Priority Mail. They provide the shipping boxes in bulk at no charge so I have a few of just about every size they offer on hand, and then, of course, corrugated also recycles. 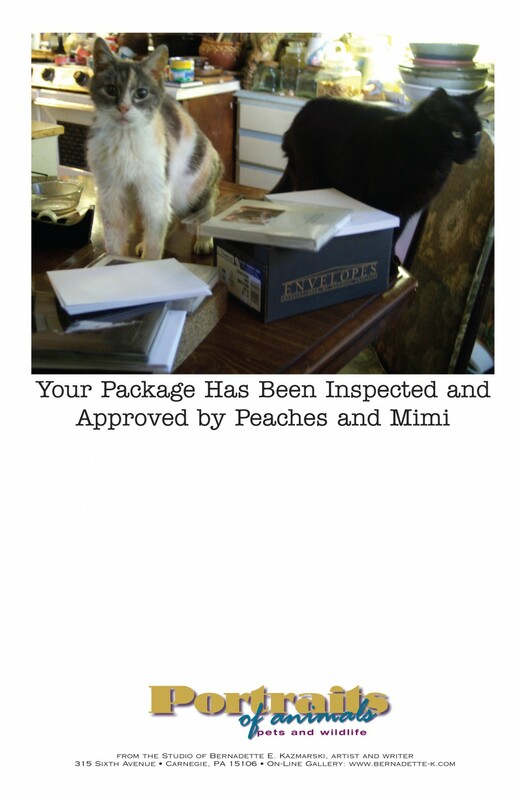 Peaches and Mimi Package Insert. You may have seen another package insert as well, especially if I needed to write a note to you with your order or just say “thank you”. 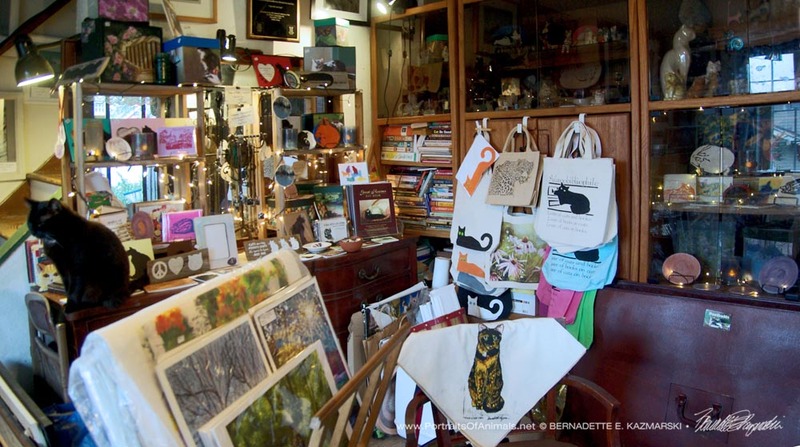 I first published my Animal Sympathy Cards in 2009, and by 2010 a number of veterinary clinics had discovered them. 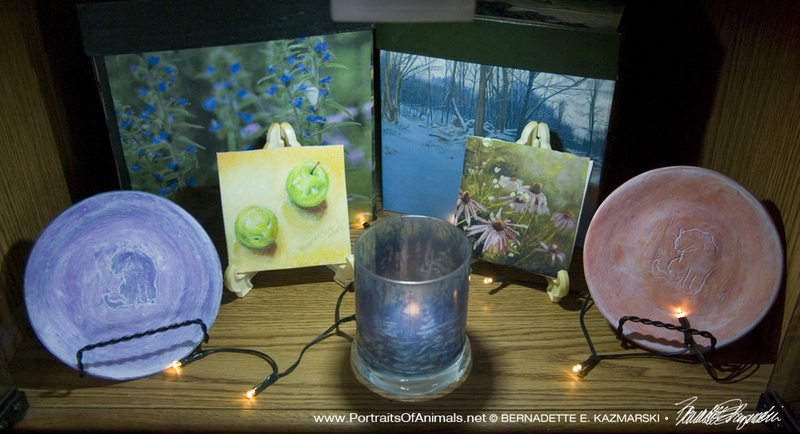 My studio was full of stuff, paperwork for my mother and brother, and none too clean, and the only place I had to package wholesale orders for dozens of cards was on the kitchen table. But of course this could not be accomplished without feline supervision. Peaches was in her last summer and I never minded when she got involved in whatever I was doing because I knew we had a finite amount of time together. Mimi was just getting accustomed to the idea that she was staying here, and spent time with both Peaches and Cookie learning how to be a house cat. I loved seeing the relationship between these two perfectly sweet cats, and spending time with them as well, even if it took me a little longer to pack the order. I took this photo of the two of them as I packed my very first wholesale order to a veterinary clinic, and so it became the package insert you see here. Time has passed, my feline family has changed and the kitchen table and chairs have moved on to better homes, and really, the photo is not that attractive. But for sentimental value I can’t bring myself to change it. And it’s always heartening when people respond to both of these package inserts, sending a hello to Peaches and Mimi, and telling me they looked everywhere for their free cat hair but didn’t find it—or that they did and they’re so glad to have collectors’ edition cat hairs! It’s not just what I sell, it’s a little part of each of us. I’m looking forward to a great summer of all new and unique things to make!